As I did with the Australian Open (and intend to do with all grand slam events this year), I will be providing win probability graphs for all French Open matches. 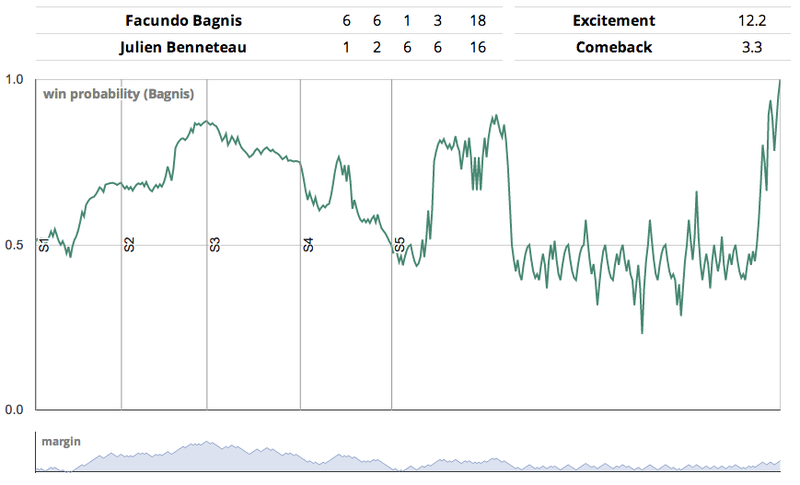 Here is the link: Tennis In-Game Win Probability. My initial post on this topic, focusing on Victoria Duval's shocking upset of Samantha Stosur in the US Open has some additional background. For these graphs, each game starts at 50/50 because I am using generic probabilities for winning a point on serve and return (62.5% and 37.5% respectively). It is possible to alter the probabilities to line up with the pre-match odds, but it's not something I can automate very easily. The biggest comeback comes from the women's first round, with Stephanie Voegele coming back from a 4.2% win probability to defeat Anna-Lena Friedsam. Graphs will update daily(ish) throughout the tournament.